One of the main goals of the users of WhatsApp is to change the WhatsApp colours to flee the corporate green color of the brand. I think almost everyone tried to change the colour of the WhatsApp on their Android mobile. As we all know that it is not easy to alter the colors of the WhatsApp unless you count on your power with a Xiaomi terminal, thanks to which you can vary the tone of the application in a blink of an eye. There are few apps like Substratum themes, which helps us to change our WhatsApp messaging app colours, but for this, we have to root our mobile because we need superuser permission to carry out the color changes in the messaging application that dominates the iOS and the Android apps markets. However, browsing the Xiaomi theme settings we have discovered a theme that allows you to change the colour of WhatsApp and it is done without rooting your mobile. If you are a Xiaomi user then this trick is for you. All you have to do is to apply the theme that we indicate a few lines below to see how your application changes to blue by magic. To alter the appearance of WhatsApp on Xiaomi Mobile you must access the themes application and locate the so-called Diwali 2017 light. Now, you have to download that item on your phone, for free and install it. 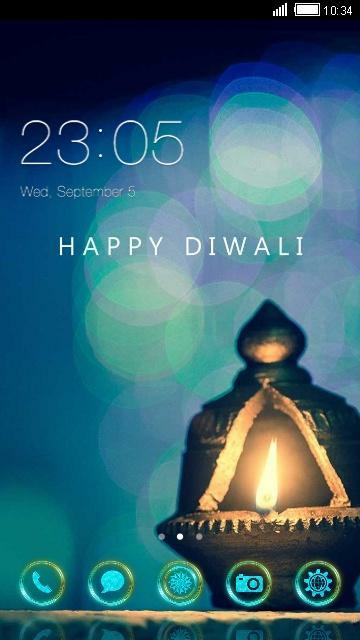 Once it is done you can see the change of the icons, themes or wallpapers of your Xiaomi smartphone to a Diwali theme. Do not panic. If you access any application you can see the same as before. Now, open your WhatsApp and there you can see the change in the color of the home bar, settings, call button, etc from green to dark blue. Somehow this theme has managed to change the WhatsApp color, going from classic green to a dark blue as shown in the below picture. If you don’t want this color change, you can go to themes and revert back to the theme you have before. This is how we can change colors in Xiaomi mobile for WhatsApp application. It is likely that there are other issues in MIUI or other operating systems that achieve the same effect, so we continue to dive into the huge personalisation catalogue of all the mobile phones on the market. I hope this article helps you to change your WhatsApp color of your Xiaomi mobile. If you are facing any issues while following the above process, let us know in the comment section below. We will get back to you to solve all your queries as soon as possible. Let us know if it worked for you or not in the comment box. To which color do you want to change your WhatsApp Application?